In November 2014 at the annual CRUX CRAFT FAIR in Devon’s Rattery Village Hall I found what I had been searching years to find! A large and very solid willow basket amongst a beautiful display of baskets of all shapes and sizes. Better still, I enjoyed my first encounter with their maker Hilary Burns a local basket maker. Hilary is a true crafts person who takes time for the whole process of basket making to proceed. As the widow of the potter, Noel Cousins, I know how much time many of the crafts take. As a therapist who works through the Arts with the youngest traumatized children, time really is as long as it takes! My good friend and a pioneer in early childhood education and therapy, Elinor Goldschmied, shared that attitude with me. 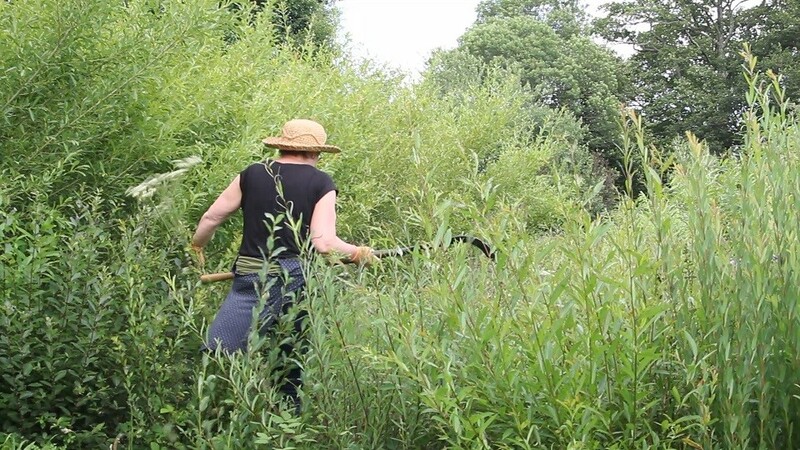 She was the creator of a specially made treasure basket for her ‘training’ film ‘Infants at Work.’ Like Elinor’s basket maker, Hilary begins at the beginning.She grows and cuts willow at her Dartington field- within sight of where Elinor lived and worked! Then she grades, bundles and stores the willow until it has seasoned so that the smell, textures and colours remain. For Elinor, “natural willow baskets reflect the richness of nature itself!” But who was Elinor Goldschmied and why were all those sensorial experiences so important for her and for the development and learning of babies? Gloucestershire in 1910. Their large garden had adjoining fields, woods and beautiful countryside all around and as Elinor said “….nature gave me comfort when I lost a favourite brother and then my mother at an early age…….we should never deny the impact of our childhood experiences either on our own life long development or on our professional thinking about young children.” At the age of 18 Elinor went to the Froebel College in London to train as a Nursery teacher but found the state system of education too restrictive. Large numbers of pupils in classrooms surrounded by hard playgrounds were far too un-natural so she went instead to become a ‘house-mother’ at the progressive Dartington Hall School in Devon. The Froebelian philosophy of enabling young children to learn and develop in gardens and through play was in tune with her own beliefs. It was in those exceptional circumstances that Elinor closely observed the changes in those children when they were given a special ‘key person’ to relate to and help them to settle. They began to make friends and adjust to new routines and freedom. It was here that Elinor used her own experiences of ‘loss’ and helped them to experience “natural beauty”. As well as changing the Home indoors, to help their healing she turned to nature to develop a garden with them. Her work with such sad children laid the foundations for all Elinor’s future work in re-organising childcare institutions in Britain and later in Italy where she went to live after the War. Guido died tragically young in 1951 so Elinor moved with baby Marco to Milan to be with a sister. She soon became the director of a large orphanage for illegitimate babies. Set up by Mussolini, the rules of that orphanage were more like those of a place of punishment for “….naughty mothers…and very distressed or silently traumatized infants.” Elinor picked up the threads of her psychological studies of the crucial importance of “relatedness to key persons.” She also resumed her creative life as a film maker and made her first films of babies taken out of their cots to reawaken all their senses and experience the world around them. Once again Elinor emphasised the importance of nature for the holistic and healthy development of babies. She filmed those infants gradually gaining the confidence to explore the natural objects placed at first on the floor near them and then in baskets or to be found by them as they played and explored in the garden. These films were used politically to influence many of the changes in institutional care of babies in Italy. They are now in the Froebel Archive at Roehampton. Much later Elinor developed those ‘Treasure Baskets’ with a friend and colleague Anita Hughes. When Elinor returned to London in 1955 to continue her psychological studies with Professor John Bowlby, she became a senior social work inspector with the old London County Council and then the Inner London Education Authority. Eventually she became a consultant with the National Children’s Bureau to collaborate with others to write books and resume making or directing educational films with the child psychologist Anita Hughes. These are still used for the training of Nursery staff. 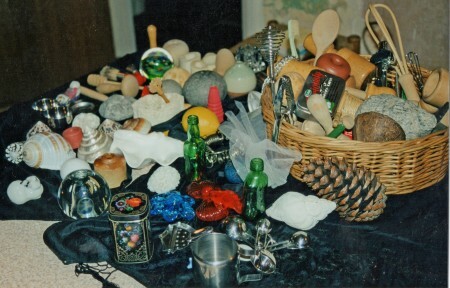 Her “treasure baskets for seated babies” and “heuristic or discovery play” with older infants were, in her opinion, the most significant work in her life. Elinor’s search for the correct baskets began at that time. None of the mass – produced baskets provided the babies with the sensorial experiences, sturdiness or safe comfort babies need to freely explore. While domestic baskets can be much smaller, Elinor insisted that the group baskets be at least 18 inches diameter X 5 inches high with a firm base and smooth top for the babies to lean on. It had to be filled to the brim by the babies’ families and nursery staff together. Their choices of the natural materials and simple, safe, inexpensive and interesting objects which give the babies many opportunities for their unhindered exploration through their senses. Some simply watched while others explored energetically or with long concentration. The adults play an important part by sitting within sight of their infants but without talking to them or interrupting their natural curiosity which Elinor regarded as the basis of real learning. Much of Elinor’s pioneering work on the brain has been used in recent years to observe, diagnose, assess and intervene for any identifiable developmental difficulties in babies and to test current neurological theories. Now that I have found Hilary and a young local film maker,Jon Merriott, we will be able to take Elinor’s work and our learning about infants even further. We have started to make a film ‘Whispering Willows Treasure Baskets.’ So far it shows Hilary amongst her willows and engaged in the basket making process.Our first beautiful baskets have just been woven. At our autumn celebration of the life of Elinor Goldschmied we will have a special Treasure Basket party to start to fill them! I wonder whether we will find Elinor’s total of 100 objects with “no plastics!’? We will film our choices and later show how the baskets are used by babies at our Totnes DAISY & RAINBOW Children’s Centres. 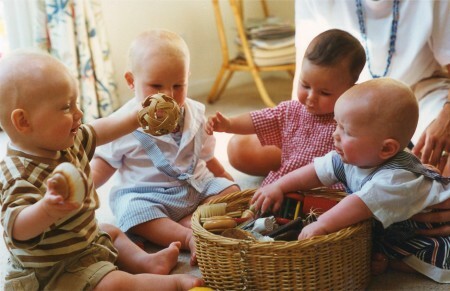 Perhaps other basket makers will feel inspired and will make their infants a Treasure Basket? Watch this space! In the next edition of your journal I will include a list of objects you may have or can find.